The Speed Monitoring Awareness Radar Trailer, or SMART, is a portable, self-contained speed display unit used for public safety and public awareness. The SMART is a valuable traffic safety tool because it allows the police department to place it in areas of concern. The trailer not only allows motorists to view their speed, but it also records data that is useful for the planning of special enforcement. The SMART is utilized throughout the city with a special emphasis in residential areas. The police department welcomes citizen comments and concerns about traffic problems and encourages requests for the utilization of the SMART anywhere in the city. Phase #1 - A request is received from a concerned citizen detailing the traffic concerns. Phase #2 - Speed pads are set up on the street in question for a period of up to one week to collect data. Phase #3 - Data is downloaded to see if a speeding problem does exist. For there to be a speeding problem, 85th percentile speed must exceed seven mph over the posted speed limit. 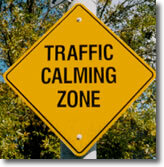 Phase #4 - If a speeding problem is not found, information collected will be forwarded to the complaining citizen. If a speeding problem does exist, the speed trailer will be set up on that street for a period of up to one week to educate the motorists in that area. Phase #5 - At the end of the one week, the speed pads will again be set up to collect data. If a speeding problem continues to exist, strict traffic enforcement will commence for a period of up to two weeks. Information obtained through data collection will help determine peak times for enforcement. Signs indicating "ZERO TOLERANCE" will also be posted on the street during this time. Phase #6 - At the end of the two-week enforcement period, the speed pads will again be set out to collect data to see if the problem has been corrected.